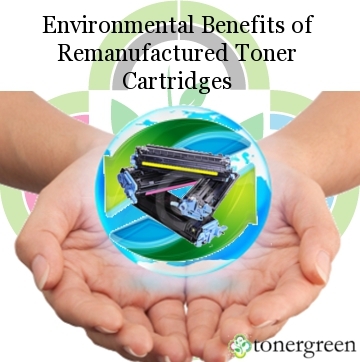 Environmental Benefits of Remanufactured Toner Cartridges | TonerGreen - Eco-Friendly Toners from the U.S.
As the Green Economy Campaign starts in, more business organizations are starting to use green products and energy-saving machines to lessen their carbon emission and conserve non-renewable energy to make a positive impact on the environment. And the printing industry supports this act by manufacturing eco-friendly printers with energy-saving mode, automatic on/off setting and by refurbishing or refurbishing used OEM cartridges popularly known as "remanufactured toner cartridges". Remanufactured toner cartridges shortly called as "remans", are empty OEM cartridges that have been recycled and refurbished by professional remanufacturers. These are usually produced by third party manufacturers that recycle used original toner cartridges. Remanufacturing toner cartridges involves several quality control processes to ensure that these recycled toners can meet the standards and performance of those new OEM cartridges. These steps normally include inspection of raw materials, sorting of those toner cartridges that can still be turned into high-quality printer supplies and those who are not, disassembling, cleaning, digital filling of toner, sealing, assembling, post-testing, quality control and then packaging. Reduce waste on landfills - Using remanufactured toner cartridges keep non-biodegradable materials out of our landfills including plastic, metal, rubber and toner. On an average note, it takes 725 years for a discarded cartridge to decompose. Conserve natural resources and raw materials - Remanufacturing used toner cartridges also minimizes the amount of raw materials used in making new cartridges. It also reduces pollution and the usage of non-biodegradable materials such as metal, foam, aluminum and steel. Conserve energy - Using remanufactured toner cartridges also saves energy. In every production of a single toner cartridge, 3 quarts of oil are burned and by buying remanufactured toner cartridges instead of new one, you can save that amount of oil. So where can you buy these remanufactured toner cartridges? At TonerGreen.com, a reliable environment-conscious retailer shop, provides you with an extensive line of remanufactured toner cartridges for major printer brands like HP, Brother, Canon, Dell, Epson and Xerox printers. Our products are not just ordinary and recycled cartridges, quality is strictly imposed every step of the remanufacturing process until our products are shipped or picked up by the customers. With TonerGreen, you can be sure that our laser toner cartridges will work in your printer and provide you with high-quality output.